Over our 30-year history, DBS&A has been recognized by a variety of organizations. 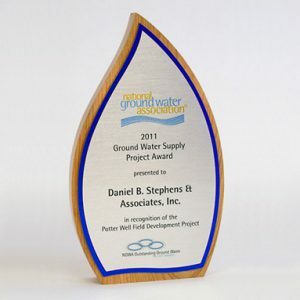 In 2011, the National Ground Water Association presented DBS&A with the award for Outstanding Ground Water Supply Project for the City of Amarillo’s Potter County Well Field Project. U.S. Patent and Trademark Office Patent No. 6,749,368, 2004, Design monitoring and control of soil carburetors for degradation of volatile compounds. U.S. Patent and Trademark Office Patent No. 6,467,994 B1, 2002, Apparatus and method for beneficial use or handling of run-off or collected water. U.S. Patent and Trademark Office Patent No. 6,139,221, 2000, Constant hydraulic head moat and method for controlling regional ground water flow.